During the 2016 presidential campaign, Donald Trump showed us who he was: a bully, a liar, a narcissist and a con man. Millions of Americans — not the majority — voted for him anyway. So here we are, two years into Trump’s chaotic presidency. Ever more shocking daily events confirm that Americans should have heeded Maya Angelou’s words and believed Trump the first time. Once a con man, bully and liar, always a con man, bully and liar. And yet, incredible as it seems, nearly 40 percent of Americans still stand by their man. His boast during the campaign that “I could stand in the middle of 5th Avenue and shoot somebody and I wouldn’t lose voters” has proven right. After Secretary of State Rex Tillerson, one of Trump’s “best people,” got fired, he revealed that he often had to push back on Trump’s illegal demands. Trump responded by calling Tillerson, “dumb as a rock.” Why would any president select someone he considered “dumb as a rock” to be Secretary of State. Trump’s supporters don’t care. Michael Flynn, who briefly served as Trump’s National Security Advisor, led raucous “lock her up” cheers at the 2016 Republican National Convention. Flynn, himself, may be the one locked up after having lied to the FBI. Trump fans? They don’t care. Speaking of jail, how about that Paul Manafort, Trump’s former campaign manager, a grifter who now calls jail home? The “witch hunt” has caught lots of witches, but Trump fans still buy the “witch hunt” claim. After Michael Cohen, Trump’s lawyer for 12 years, flipped and began cooperating with the Mueller investigation, Trump called Cohen “weak,” neglecting to explain why he would retain a “weak” person for 12 years. Trump fans? Yet again, they don’t care. The Trump Foundation is shutting down after an investigation by The New York State attorney general’s office, which noted the foundation was “little more than a checkbook to serve the Trump business and political interests.” Trump fans never minded that Trump University had been proven to be a fraud. Their apparent message: Our guy may be a con man, but he’s our con man. During his campaign rallies, Trump would whip his devoted followers into a frenzy when he promised to build a wall and that Mexico would pay for it. As it happened, Mexico would not pay for the wall so Trump turned his wrath on the Democrats who refused to pay for what Mexico was supposed to pay for. Trump and his fans forgot that promise. As a candidate, Trump told Fox News host Sean Hannity that he would reduce the federal deficit “fairly quickly.” Oops, not so fast. The deficit has ballooned under Trump’s watch, thanks in large part to tax cuts for the rich and for corporations. Deficits don’t matter to Trump loyalists, it seems, if they’re incurred under Republican leadership. Trump recently boasted to American troops in Iraq that he had gotten them a 10 percent raise, an outright lie. The actual raise was 2.6 percent. I wonder why people who claim to support our military remain true to a man who lies to everyone — including members of our military. 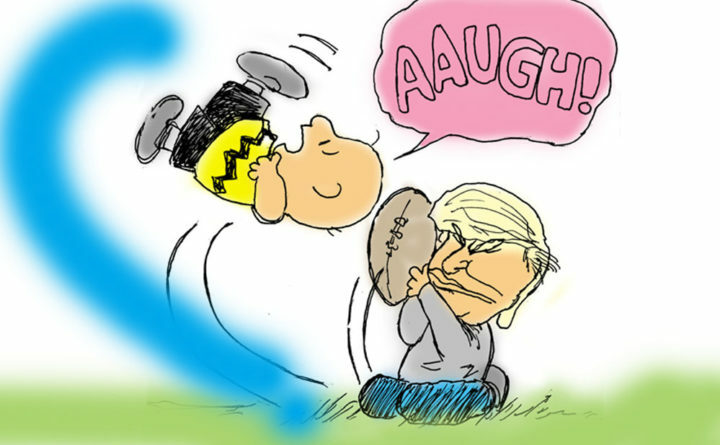 Remember those Peanuts cartoons in which Lucy always promised not to pull away the football? Charlie Brown always believed her and then, yes, Lucy always pulled it away. That cartoon was funny. It is not funny that America has so many Charlie Browns willing to believe that Donald Trump cares about anyone other than himself. It is an American tragedy. David Treadwell is a Brunswick writer.